SYDNEY's housing crisis is driving people onto the streets. "Contrary to popular perception, while alcohol and drugs can keep people on the streets, they are not the main pathway to homelessness," Wesley Mission chief executive, the Reverend Keith Garner, said. The study is contained in a report, More Than A Bed: Sydney's Homeless Speak Out, which will be launched today by Mr Garner and Federal Housing Minister and Member for Sydney Tanya Plibersek. A quarter of respondents said that, before becoming homeless, they had been earning an income greater than that which the Australian Bureau of Statistics terms "medium high" for Sydney. Mr Garner said the study showed how easy it was for an ordinary person to slip through the cracks to a life on the streets. The study - conducted over six weeks and involving 206 homeless people staying in six inner-city shelters - found that relationship breakdown was the second leading cause of homelessness and that the trauma of childhood abuse had the greatest impact on the wellbeing of homeless people. 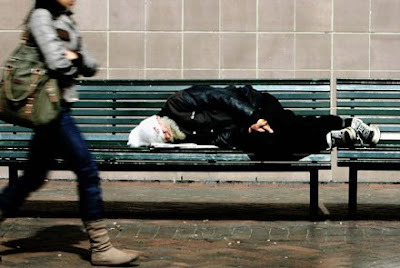 As well, the research found that, despite popular perceptions, most inner-Sydney homeless people had originally come from elsewhere, including outer Sydney suburbs, the Hunter and the Illawarra. The study also found that once a person became homeless, it was difficult to live a secure life again. Almost one in five of those surveyed had been on the streets for five to 10 years, while two-thirds had found themselves in crisis accommodation up to six times. "Since the housing problems and the pressure on people's incomes, there is no doubt that there's more people turning to us for help," Mr Garner said. Wesley Mission has outlined an action plan to tackle chronic long-term homelessness. It includes an integrated approach for people to gain access to mental health services, addictions rehabilitation, relationship counselling, occupational therapy and legal services.